Trump Has Made A Final Decision On His Supreme Court Pick The president has made up his mind, but he's not saying who it is just yet. He will announce his pick officially to replace retiring Justice Anthony Kennedy in a prime-time ceremony Monday night. 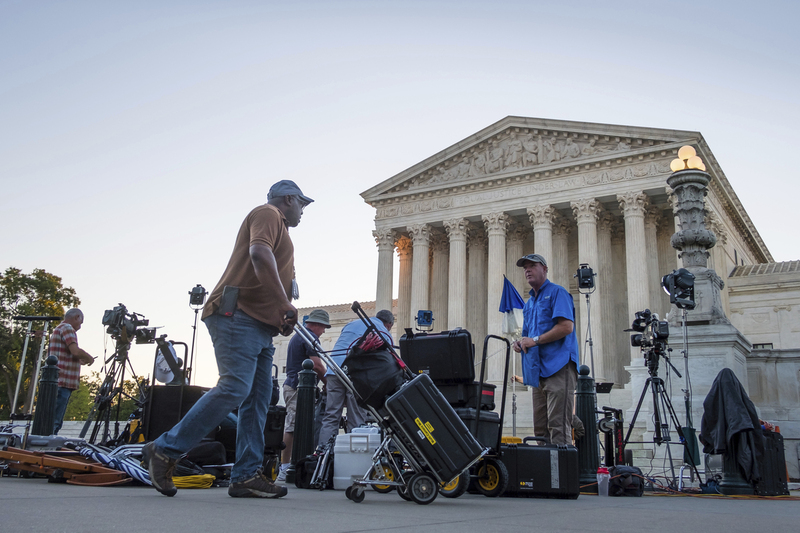 With just hours to go before the official announcement, President Trump has made a decision on his pick for the next Supreme Court justice, a source close to the decision-making process tells NPR's Mara Liasson. But there is still no indication which of the four finalists it will be. As of Monday morning, Trump was still deciding among Judges Thomas Hardiman, Brett Kavanaugh, Raymond Kethledge and Amy Coney Barrett. After less than two weeks of deliberations, Trump is set to announce Monday at 9 p.m. ET his nominee to replace retiring Supreme Court Justice Anthony Kennedy, a choice that could well affect the court, and Americans' constitutional rights, for a generation. Hardiman was the runner-up to succeed Antonin Scalia, the seat Neil Gorsuch eventually occupied after being confirmed in 2017. The president has again been impressed by his life story, as someone with humble roots — the first in his family to go to college and even that he drove a taxi to help pay for law school. But the president has also been impressed by Kavanaugh, the most experienced judge on the list, having penned nearly 300 decisions on the second-most-powerful court in the country; as well as Barrett, a devout Catholic, who has become a hero of religious conservatives after having her membership in a conservative religious organization questioned by Sen. Dianne Feinstein last year during her confirmation hearing to the federal bench. Kavanaugh's ties to the Bush administration and his lengthy paper trail as well as Barrett's lack of experience — just one year as a judge — were seen as negatives for each. Anticipation was high on Capitol Hill in the hours leading up to the announcement. Senate Majority Whip John Cornyn, R-Texas, told reporters that he was really pleased with the chance to confirm a second conservative justice to the Supreme Court in two years. "I didn't know Justice Kennedy was going make this decision to retire but I like the timing and I think the quality of the potential successors is very high," Cornyn said. "So I'm happy." The White House announced Monday that former Sen. Jon Kyl, R-Ariz., would guide the nominee through the confirmation process, including preparing for meetings with senators. Senate Republicans are pleased that Kyl will be the one to help the nominee navigate the arduous confirmation process. He is well-liked in the Senate and was personally recommended by Senate Majority Leader Mitch McConnell as a good choice to support the president's nominee prep for one-on-one sessions on Capitol Hill. His job, known as the "Sherpa," is to help the nominee anticipate the types of questions senators might pose. He might also be asked to sit in on the meetings or help guide the conversations behind closed doors. Kyl will also work with the nominee ahead of public hearings and other events. Republican aides said Monday that they expect the whole process could take about two months. It is a high-profile vetting process that will kick off with the public event at the White House on Monday night. Cornyn told reporters that he will join about 30 Senate Republicans at the White House prime-time announcement. Three of the most endangered Senate Democrats — Sens. Joe Donnelly, D-Ind., Heidi Heitkamp, D-N.D., and Joe Manchin, D-W.Va.— were also invited to the event but will not be attending. Kethledge, a former Kennedy law clerk, has sat on the 6th Circuit since 2008 after being nominated by George W. Bush. He is 51, and among all the reported shortlisters, he is the only non-Catholic. He is an evangelical Christian whose book, Lead Yourself First, uses President Dwight Eisenhower, primatologist Jane Goodall, Winston Churchill, Martin Luther King Jr. and others as examples of "leaders who have used solitude to function more effectively." Barrett, who is 46, has less of a judicial record to review, having just been nominated to the appeals court by Trump last year. She is a former University of Notre Dame law professor (and a graduate of the school; Kavanaugh, meanwhile, received his undergrad and law degrees from Yale). She was a law clerk for Scalia. During her nomination hearing before the Senate Judiciary Committee, Barrett was questioned about her religious beliefs. Sen. Dianne Feinstein told Barrett, a Catholic, that "the dogma lives loudly within you," suggesting her faith would influence her judicial decisions — a statement that was roundly criticized. Such comments are likely to raise a red flag to moderate Republican senators like Susan Collins, R-Maine, who have said they would not vote for a nominee who has expressed doubts about observing precedents when it comes to abortion and other long-standing Supreme Court decisions. More than the other potential nominees, Hardiman has a strong record in favor of gun rights. When the court he serves on upheld a New Jersey law requiring a gun owner to obtain a permit to carry a gun in public places and show "a justifiable need" to carry the gun, Hardiman dissented, chastising the majority for upholding a law that dates to 1966 (and arguably 1924) as insufficiently long-standing. Kavanaugh, 53, was first nominated to the appeals court by President George W. Bush in 2003. He had previously worked with independent counsel Kenneth Starr in the investigation of President Bill Clinton and was involved in the Florida presidential vote recount in 2000. In a 2013 law review article, Kavanaugh wrote that after seeing firsthand the many difficult duties that a president encounters, he thinks that presidents should operate free from the threat of civil suits, such as the sexual harassment suit that led to Clinton's impeachment, and that presidents should also be free from criminal investigation. Those views could have implications for independent counsel Robert Mueller's investigation of Trump. "I'm open to voting yes. I'm open to voting no. We don't know who the nominee is going to be yet," Sen. Doug Jones, D-Ala., said in a Sunday interview on CNN's State of the Union. "I don't think my role is to rubber-stamp for the president, but it's also not an automatic knee-jerk no, either." McConnell has promised a vote on the nomination before the November midterms, ensuring the outcome will be an issue before voters.